We are all advised to have a 72 hour kit in case of an emergency. Finally, I made a couple. 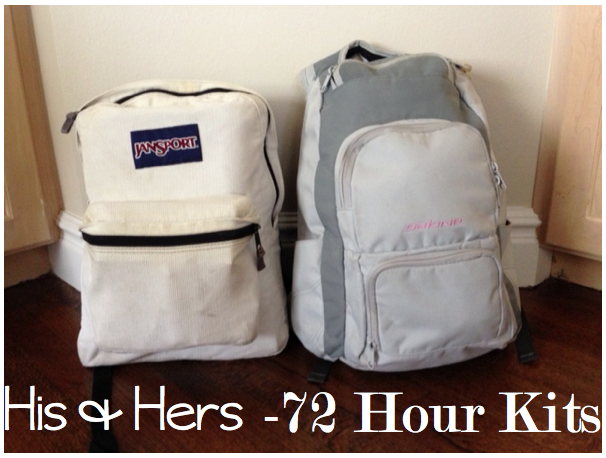 In fact I made his and hers since women typically need different things than men. Here's the list of stuff I put in our bags. -First Aid Kit- I made this one by hand. It had needle and thread, bandaids, over the counter painkillers, neosporin, ankle wrap, medical tape and tweezers, gauze. I put the blankets against the back of the bag so when we wear them it's cushioned. Fill them up as you see fit. If you have any extra room, add more water and food, or a change of clothes. Be safe out there everyone, and let's hope we never need to use these. Thanks for the great reminder (motivation)!